The recent US Census reveled the country may be becoming the United States of Hispanic America, with huge growth in Latino numbers comes a series of political and social changes. The culture and language of Latinos is a big part of America’s past, and likely, an even greater part of its future. Latinos are not just coming to the big cities anymore. They are moving deep into America’s heartland, challenging the status quo and changing the electoral map in traditionally conservative states. “We’re the future and we’re not going to go anywhere,” said immigrant activist Juan Jose Gutierrez. “When you start dealing with the aspect of economics I think that there is no denying that the Latino community is very important”. While Americans are long used to seeing Latinos harvesting their crops, building their homes and caring for their children, now they will increasingly see Latinos playing a major role in rural America’s future; something some people in rural areas may not be ready for. After years of under-representation in government, harassment by law enforcement and widespread discrimination, the 48 million strong Hispanic community is beginning to sense its strength as America’s largest minority. It is flexing its political muscle and fighting for its rights. “This is a community that is getting together and saying hey, we’ve had enough of these abuses.We’ve had enough of people coming down on us over and over and a political system that doesn’t represent us,” said community organizer Jose Lara. Politicians better take note.While Republicans are sure to rejoice as traditionally red states gain additional house seats, they may be less thrilled that this reapportioning is thanks to increases in the immigrant population, specifically Latinos unhappy with what they see as hostile anti-immigration stance of the Republican Party. Hispanics accounted for more than 50 percent of the past decade’s population growth. More than 15 million are US Citizens under the age of 18 and not eligible to vote, but they will be very soon. Latino movements will be sure to use it to their political advantage. “They’re gonna care, they’re going to have to care, cause we represent in California almost 21 percent of the electorate,” said Latino activist Axel Caballero. The growing number of Latinos is changing the look, sound and taste of America and is poised to change both the tone and direction of the political debate. Mark Lopez, the associate director of the Pew Hispanic Center in Washington explained the rise in Latinos will change the American political map. He explained there are some differences of diversity within the Hispanic population nationwide. 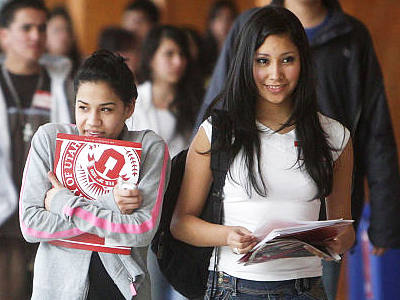 States across the country have seen the Hispanic population growing tremendously. The growth shows to only whole number increase, but also a spread in population. Hispanics have diffused into states that are not necessarily along the US-Mexico border. Politicians, especially Republicans have worked to reach out to the Latino population, a move many have scoffed at. Lopez explained this is a smart move, as the Hispanic population is not always a Democratic strong hold. “While Hispanics have tended in recent elections to lean very heavily Democrat, there have been times when you have seen a large share of Hispanics vote Republican,” Lopez said. A great example of this was the 2004 US Presidential election, where about 40 to 44 percent of Hispanics voted for George W. Bush. Lopez explained the recent growth in the Latino population is only the beginning and will continue over the next three or four decades. Activist Ron Gochez said the rise in Latino population will carry over into a rise in Latino political influence, and politicians should pay attention. “Right now we are a large part of the electorate. But we’re going to be a gigantic part of it in the very near future,” he said. Many elections in the US were made or broken in 2008 and 2010 by the Latin vote, he explained. The same will be truer in the future. American politicians will need to change their approach in future elections.